Bee pollen are pollen granules collected and processed by bees. It is collected from flowers during pollination. The pollen contains small amounts of minerals and vitamins and is very high in protein and carbohydrates. The pollen is made by worker honeybees who pack the collected pollen into granules (pollen balls) with added honey or nectar. The pollen is also mixed with enzymes, fungi and bacteria. This results in pollen that is higher in nutrition than untreated pollen and is the primary source of protein for the hive. The average composition of bee pollen is said to be 55% carbohydrates, 35% proteins, 3% minerals and vitamins, 2% fatty acids, and 5% of diverse other components. Although many people take bee pollen as a health supplement, it can cause severe anaphylactic reactions. However, most people are unaware of the risks, states an article published in CMAJ (Canadian Medical Association Journal). 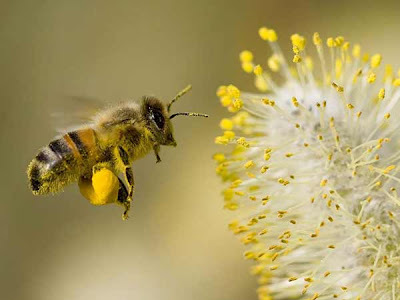 A case study in the journal illuminates the possible hazards of ingesting bee pollen. A 30-year-old woman with seasonal allergies but no history of allergies to food, drugs, insects or latex had an anaphylactic reaction after taking bee pollen. She had swelling of the eyelids, lips and throat, difficulty swallowing, hives and other life-threatening symptoms. After emergency treatment and discontinuation of the bee pollen supplements, there were no further reactions. "Anaphylaxis associated with the consumption of bee pollen has been reported in the literature, but many people remain unaware of this potential hazard," write Dr. Amanda Jagdis, University of British Columbia, and Dr. Gordon Sussman, St. Michael's Hospital and the University of Toronto. Anaphylactic reactions after ingesting bee pollen have been reported in people with no history of allergies or only seasonal allergies. In a Greek study in which atopic participants underwent skin tests for reactions to bee pollen, 73% (of 145 patients) had positive skin test reactions to one or more types of bee pollen extracts. "Health care providers should be aware of the potential for reaction, and patients with pollen allergy should be advised of the potential risk when consuming these products — it is not known who will have an allergic reaction upon ingesting bee pollen," conclude the authors.